Are Californians doing everything possible to minimize energy consumption? Are homes saving or costing homeowners when it comes to energy bills, personal health, or their family’s health? While most homeowners would like to lower their energy bills by replacing old energy-hogging appliances, unless they have the financial means, they are not able to consider this option. However, as California moves towards decarbonization and zero net energy for all buildings, local and regional governments are beginning to offer incentives for old appliance replacements and energy upgrades. This LGSEC Member Spotlight showcases a incentive program addressing energy efficiency improvements in residential homes. San Gabriel Valley Council of Governments (SGVCOG) created the Energy Assessment Screening for Your Home (EASY) program, which is free and offered to homeowners who have high utility bills, have a lot of dust in their homes, or are experiencing temperature swings within the home. EASY sends out two consultants to complete a home walkthrough. The consultants check appliances, electronics, insulation and air sealing, lighting, heating and cooling, windows and doors, and indoor and outdoor water usage to take a holistic approach of the house’s energy system and usage. After the walkthrough, the consultants will review the homeowner’s utility data/energy usage from the previous 12 months to create a customized energy efficiency plan, and suggest changes in the home that will achieve energy savings and improve indoor air quality. After, homeowners receive a tailored three short-term and low-cost improvements and three long-term, higher-cost improvements. Homeowners then have the option to make eligible improvements for up at $6,500 in rebates from local programs. 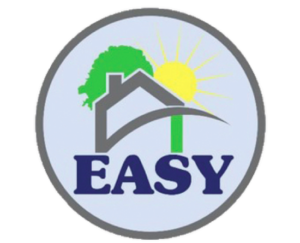 EASY has been in running since March 2015 and has reached participants in nearly all cities within the San Gabriel Valley region. The program has seen a success rate of about 71% of participants completing at least one of the recommended changes. However, SGVCOG found energy-purchasing behavior was more likely to adopted by adults over the age of 35 and living in permanent homes. Curtailment behavior strategies were less likely to be adopted and were more popular among middle-class women. The most popular upgrade is currently purchasing and installing LED lights because it is a simple, low-cost solution with an immediate relief in energy bills. EASY has also been effective in providing recommendations to homeowners about potential energy-saving techniques such as; replacing power strips with “smart” power strips that have timers to decrease phantom loads, and replacing plasma televisions with LED televisions. Furthermore, SGVCOG found 51% of participants were financially-motivated and 34% were environmentally-motivated to upgrade appliances and systems in their home. Since current marketing strategies are geared towards financially-motivated individuals, the 30% of participants who are more environmentally-motivated can be approached through different marketing strategies. There are four finance programs available to homeowners that provide 5 to 20 year loans for specific energy upgrades. The first is HERO which is a PACE program, meaning payments are made through property taxes and are passed onto the next owner until repayment is complete. This program has a range of over 900,000 products SGVCOG is willing to finance. The second is Cool Comfort Financing, which is for HVAC units, furnaces, heat pumps, and duct insulation upgrades. The third and fourth programs, Home Energy Loans and Statewide Clean Energy Upgrade Finance Program, both finance energy efficiency and solar projects. The latter three programs provide loans ranging from $2,500-$50,000 and require monthly payments from the homeowner. 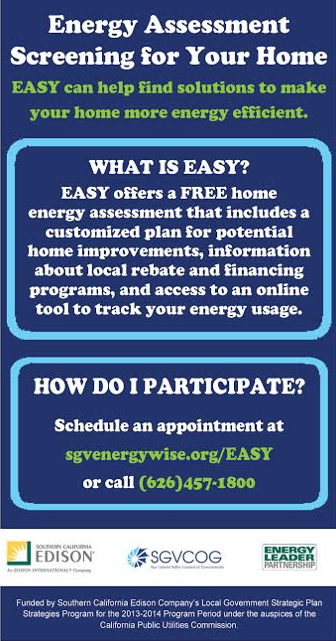 The EASY program itself is funded by the San Gabriel Valley EnergyWise Partnership, a joint venture between Socal Gas, Southern California Edison and the San Gabriel Valley Council of Governments. In its first three years, EASY has been very successful. In the future, there is room to expand EASY’s educational and auditing services to more participants in the area. SGVCOG thinks EASY will see increases in demand, as California’s continues to make progress on its ambitious energy policy and climate action strategies. SGVCOG collaborates with the San Gabriel Valley Energy Wise Partnership (SGVEWP), Southern California Edison and SoCalGas.